Fred I. Greenstein has long been one of our keenest observers of the modern presidency. In The Presidential Difference, he provides a fascinating and instructive account of the presidential qualities that have served well and poorly in the Oval Office, beginning with Franklin D. Roosevelts first hundred days. He surveys each presidents political skill, vision, cognitive style, organizational capacity, ability to communicate, and emotional intelligence--and argues that the last is the most important in predicting presidential success. 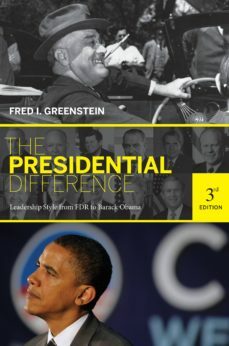 Throughout, Greenstein offers a series of bottom-line judgments on each of his thirteen subjects as well as an overarching theory of why presidents succeed or fail. In this new edition, Greenstein assesses President George W. Bush in the wake of his two terms. The book also includes a new chapter on the leadership style of President Obama and how we can expect it to affect his presidency and legacy.